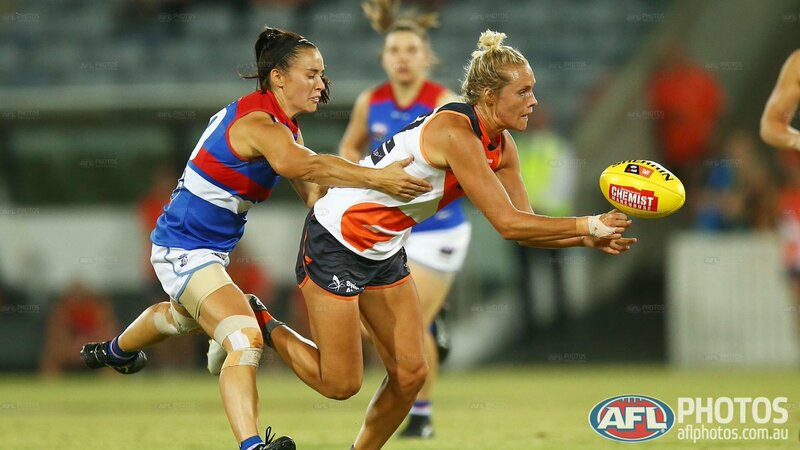 The Greater Western Sydney Giants won by 18 points over the Western Bulldogs in an enthralling AFLW match at the UNSW Canberra Oval. It was a tight contest by both teams in the first half and this was reflected on the scoreboard. As at quarter time the Dogs had a one-goal lead and the Giants had a 10-point lead at half time. The Giants took their game up a notch in the second half and made light work of the Dogs who tried hard to counteract and respond to their pressure. This win by the Giants is a statement win by the Giants to the rest of the AFLW competition. The first stanza was a tight contest played by both teams. Kirsten McLeod scored the first goal within the first 10 seconds of the match. The Dogs had a lot of the attacking play in the first quarter but credit to the Giants defense who held up well and stopped them scoring more than two goals. Dogs defense held up well and made it hard for the Giants to hold a mark in their forward half of the ground. The Dogs tackling in the opening term was great and they finished the quarter with 23 tackles to the Giants 12. Jessica Dal Pos set up a team goal, as she kicked it to Nicola Barr who kicked it to Aimee Schmidt who marked the football strongly in the forward 50. Schmidt slotted through the goal nicely for the Giants first of the match. Ellie Blackburn set up a goal as she passed to Deanna Berry who kicked the football forward. The football spilt to the back of the pack and Monique Conti ran toward the dribbling football and soccer kicked the football of the ground for her first goal in the AFLW. It was great to see Conti finally get her first goal in her AFLW career after she has been so lively up forward for the Dogs since round 1. At quarter time the Dogs held a slim lead of 6 points over the Giants in a tight encounter. It was the Giants who owned the second term, as they outscored the Dogs three goals to one. McLeod scored her second goal in the opening minute of the second quarter like she did in the first quarter. Jacinda Barclay played a great quarter for the Giants, as she was everywhere. Jodie Hicks responded with a goal soon after McLeod’s goal, as she kicked the goal from about 25m out on a slight angle and she nailed the goal. This goal was her first goal in her AFLW career. The Giants were all over the Dogs midway through the second quarter, but they were only able to score one goal for all their attacking play. They placed the Dogs defense under siege. The Irish goal sneak Cora Staunton was on fire in the second quarter as she was a part of two goals in the term. Staunton handballed out of the pack to Jessica Dal Pos on the run who kicked a beauty of a running goal of her left foot from 40m out. Dal Pos returned the favour soon after to Staunton, as she kicked the football to Staunton who marked the football and played on. On the run Staunton slotted through the goal nicely. The Irish woman Staunton was lively again up forward for the Giants and gave the Dogs defenders headaches. Staunton is an absolute star. At the main break the Giants had an 8-point advantage over the Dogs. The third quarter was filled with intense pressure and the game lifted another notch. As a result, the Dogs were the only team to kick a goal in the term. Early in the term the captain of the Giants Amanda Farrugia was taken high, but she showed her toughness as she shrugged of the trainers. It was a real arm wrestle for the first half of the quarter, because neither team could score. In the early stages of the third quarter the Dogs had majority of the attacking play and made it difficult for the Giants to get the football past the centre of the ground. Giants defense held up well for most of the quarter and it took 11 minutes for the Dogs to score the first goal of the term. Jenna Bruton nailed through an awesome goal, as she bent back the kick after the football fell to the ground and she crumbed the football well. 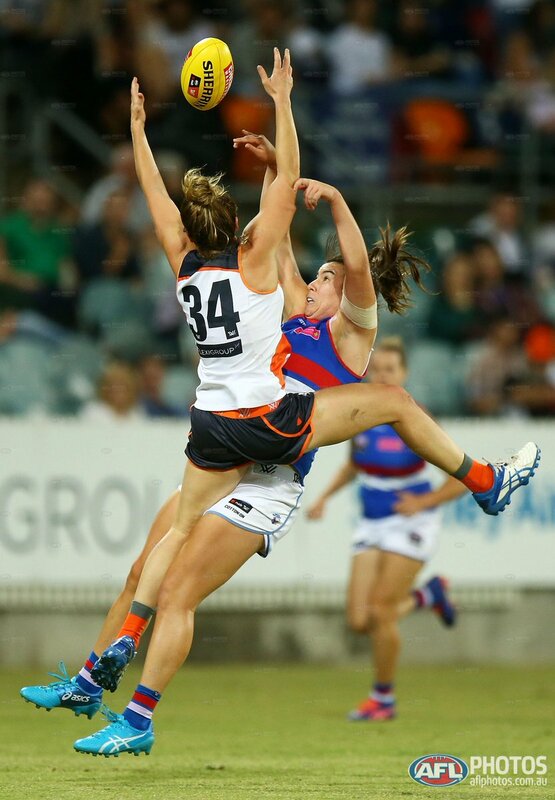 Courtney Gum continued her strong form in the AFLW especially in the third quarter she stood up well in defense for the Giants with her strong intercept marks and put a halt to the Dogs attacking play. Gum is an outright star of the AFLW. The Giants were up by two points over the Dogs at three quarter time. It was a "GIANT" final quarter from the Giants who kicked three goals to stun the premiership favourites the Dogs, as they kept them goalless. Gum the 36 year old was awarded a 50m penalty and from 40m out the superstar put through the goal nicely. Gum’s goal was the first goal of the final term. Alicia Eva kicked the Giants second consecutive goal of the final quarter and she also kicked her first goal for the Giants. It was a timely goal for the Giants. Farrugia the captain kicked her first for the club and the Giants made light work of the Dogs in this quarter. The Giants ran over the top of the Dogs by 18 points in the nations capital. It was a great final half by the Giants who now sit second on the AFLW ladder. Great to see the Giants in the top two after they finished last on the ladder last year.